I started reading this book and put it down…. mainly time restraints at the time but it wasn’t grabbing me. I wonder if audio would? It might, the narrator was really good! I enjoyed this on audio much more than I think I would have in print. And I’m not usually a fan of sound effects but the ones in this production were low-key and added to the story rather than detracting from it. I loved this book. I read an ARC of the book before it came out, but I have been dying to go back and listen to the audio version. Thank you for the review of the audiobook. It makes me even more excited to read it! I too reviewed a YA new YA audio book today: Okay for Now by Gary Schmidt. The narrator gives a strong performance, enhancing the novel immensely. He voices the text with an “adult” vocal character, although his delivery works perfectly to illuminate the quirky vernacular of Doug Swieteck, our eighth grade protagonist. Jen – I do know exactly what you mean about matching the vocal character of adult actors to youthful characters: dicey business indeed. I’ve been pretty fortunate to find many YA/children’s books in audio format in which the narrator’s been well chosen. Of course, the ones featuring a bad match go right back to the library after 1 CD, so I suppose they fade from memory quite quickly! I really liked this print book. I may try the second book on audio. I have this in print, so probably won’t listen to the audio version, but you’ve made it sound awfully tempting. I just put this audio book on hold at the library: Thanks for the rec, Jen. it always amazes me how one listener can love a narrator while another is *meh* about him or her. i listened to ‘matched’ a few months ago and found kate’s voice almost too sweet to tolerate. the music didn’t bother me but i just found her voice a tad too cloying. not sure if you’re going to touch on this topic but would it kill producers to add END OF DISC #– at the end of a disc? it makes me a bit batty when the cds just loop back to the first track with no warning. She was VERY sweet, but I thought it worked for MATCHED, Cassia is very sweet too. And thank god she at least sounded young! Some people actually did touch on the announcement or music at the end of discs today in their sound effect posts. Personally, I HATE it, because I’m always listening on my ipod and I don’t care that the disc has changed. I prefer the music to the actual announcement, but either way it pulls me out of the audio. I’ve thought about rereading this one before reading Crossed, but maybe I’ll see if I can track down the audio version instead. I fully approve of this idea. 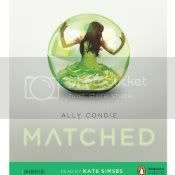 Matched Audiobook Review | Who Is Your Match?